This Skull Base LED Candle is to die for! Dress up your gothic haunted house with this ghoulish killer lighted candle for holiday home decor or throughout the year. A creepy way to provide your guests with mood setting light to haunt their Halloween! Attractive battery-operated LED bulb plastic candlestick lamp fits neatly on a windowsill without the hassle of electric cords. Shed some shimmering light on your Halloween scene with this Black Glitter Skull Base Candle Lamp. 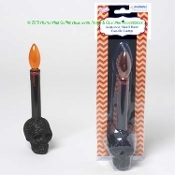 Orange tinted light bulb features fake red bloody drips decorated black plastic faux candlestick with and gothic style glittered black human skull base. LED Bulb does NOT flicker. Requires 2 AA batteries,YES- included FREE!!! Approx. 9-inch (22.5cm) tall overall. Black Glitter Skull base only approx. 2.75-inch (6.88cm) high x 2.25-inch (5.63cm) wide x 2.25-ich deep.